I went to Mexico once in college and once the year after on mission trips. With my great dislike for Mexican food, I remember seeing a Pizza Hut and being so excited that I could finally get some good food. I am embarrassed to admit that fact, and doubly embarrassed to admit that I shed a tear or two (or many) at the fact that I had to eat Mexican food while I was there. Irony: All these years later, now I absolutely love it! Honestly, it is my most favorite type of food! I am pretty sure I could eat it every single day! And not only does my hubby now have a wife that loves going out for Mexican food with him, but he has one that hogs all the guacamole! So, in my great love for Mexican food I made another version of a tostada last night. 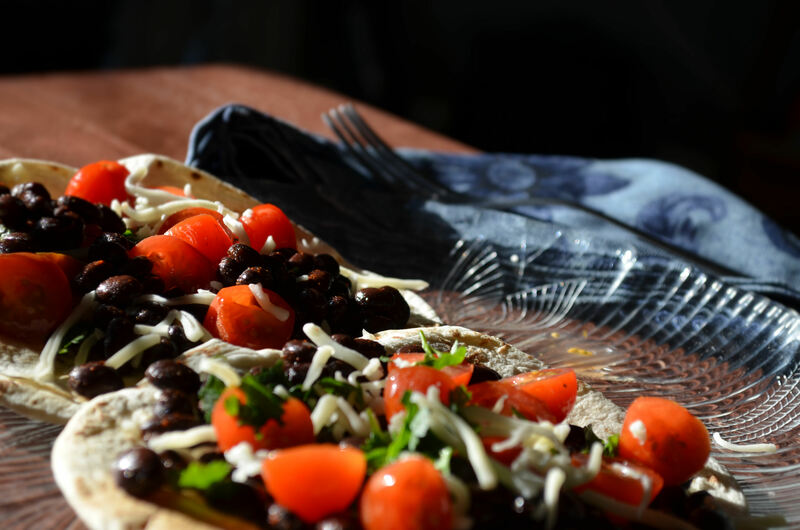 This time I kept it very simple and super quick…cold black beans covered with chili powder and honey, cherry tomatoes, lots of cilantro, and Monterrey Jack cheese. Delicious!! In a mixing bowl, sprinkle the amount of chili powder you like, along with some honey and mix thoroughly. Chop up some fresh cilantro. Put a layer of cheese on the tortillas and toast them in a toaster oven (or broil them in a regular oven). Take them out and put some of the beans on each one, along with the tomatoes, and cilantro. Add more cheese to the top if you want. Thanks Arl! I didn’t realize they change, but mine sure seems to have! I love so many things that I used to not like! That is so funny that you used to love seafood and now you can barely stand it! LOL funny story. Mexican food is almost a religion to me. One time I actually didn’t go out with a guy because he told me he didn’t like it. Deal breaker! These look fabulous! They say your taste buds change every 7 years….I don’t know. You should definitely save me one of these, though! Thanks Joanna! 🙂 I totally didn’t realize that about taste buds! So interesting! Mexican food is almost a religion in my house too ;). We love our burritos, tacos, nachos, taquitos, enchiladas etc etc! 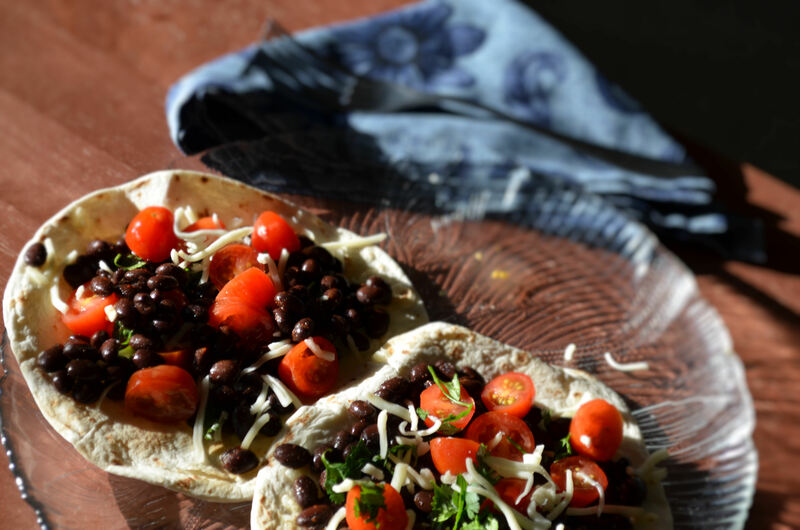 But I love tostada for an easy crisp lunch. Thanks for sharing. Black bean is my absolute favorite. I love black beans! I could eat them all day long….hehehe. Well, I am sure glad I love Mexican food now because I was definitely missing out! Never say Never” 🙂 I love Mexican food, it’s so colorful and authentic. 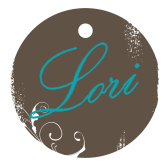 Your recipe is very tempting, Lori! Hehehe…Thanks Linda! Mexican food is the best! Cute story! I’m glad you embrace Mexican food now, these looks great!